Happy Thanksgiving! It looks like Dreamspinner Press has a pretty significant sale this year! 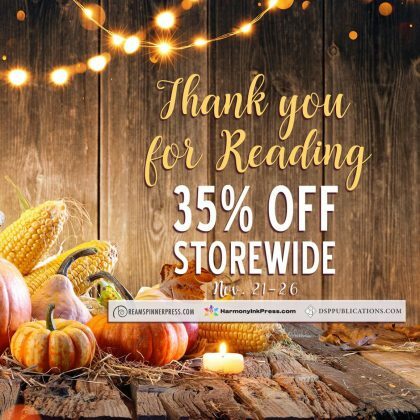 They’re taking 35% off (*insert joke about percentage of book instead of cost here*) from all imprints through November 26, 2018. 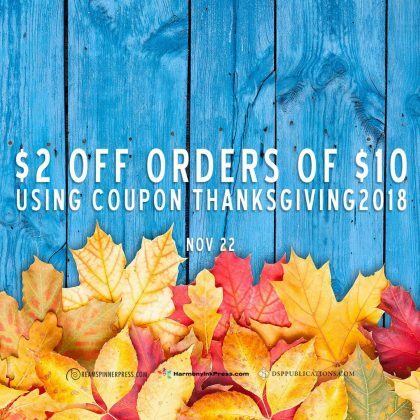 ALSO, if you order on Thanksgiving day (November 22, 2018) and purchase over $10, they’ll take another $2 off. Not bad! That said, Grace’s books are among those, obviously. No Sacrifice specifically has a pretty significant Thanksgiving scene, so that’s even topical! Also the Forbes boys get together for Thanksgiving in Forgiveness and things kind of, well, you’ll have to read it won’t you? 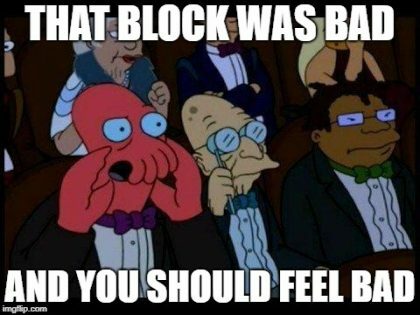 Yes, I did that – I’m a horrible person and I should feel bad. But I’m still not telling you! As well, there are a lot of great authors to check out as well at Dreamspinner and their imprints Harmony Ink and DSP Publications. Lou Hoffman is writing the freaking incredible Sun Child Chronicles that is still ongoing (book four is coming out Spring 2019). I can’t recommend that series enough. J. Scott Coatsworth’s work is exceptional. I have so many books of his to read yet! J.L. Langley has an excellent series based on, wait for it, Sci-Fi/Regency. I know right?! I’ve read the first book (and heard it on audio) and it’s really amazing. I love the world and the writing is great 😀 There’s a new book coming out called My Regelence Rake which sounds really interesting that I’m looking forward to reading, when I can. We hope you have a peaceful Thanksgiving – everyone needs that right now, I think. Be safe! 31% Halloween sale at Dreamspinner! I wonder why 31… oh. Yeah!